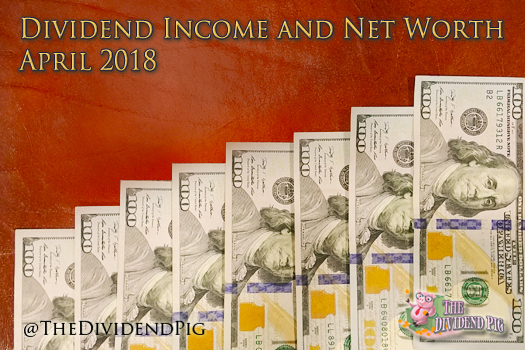 This month’s dividend income is a doozy… net worth wasn’t bad either! Another month has come and gone, again. Keeping this blog has really put a marker on how quickly life moves. Apparently, time moves faster as you age. This month I received $798.75 in dividend income! On average, I was paid $29.58 from 27 different companies!! This month’s dividend income is a mind-blowing 449.35% increase over April 2107. Thanks to Franklin Resources (BEN) who generously provided a special cash dividend of $3.00 per share – this month turned out quite impressive. Franklin Resources passed along their Trump tax cuts to their shareholders… thanks guys! This is $653.35 more dividend income than last April! Once again, the lion share of that came from BEN. However, the rest of the percent gain has come from investing a lot of capital over the last year. Thanks mostly to paying down the mortgages, net worth continued to inch up this month. I still have a lot of cash sitting around. Once again, this is from the sale of rental property #1. This money is ear marked to pay off my primary mortgage. However, as you can see, I haven’t done that yet. The market has been very volatile recently, and I have this FOMO (fear of missing out) on a huge dip. What if the market corrects? Shouldn’t I just hold on to this cash and wait until the ideal time to put my money to work? I’ve wrestled with this and still haven’t come up with the right answer yet. I’ll work on it. As for expenses, we had one big one that accounted for all that red. One of our dogs is developing alignments in her twilight years. That ran us back almost $1,000. Ugh. I’ve been continuing to pay down my mortgages with some decent success. The balance on both of these loans has been shrinking quite considerably. Just paying my loans every month is increasing my net worth by almost $3,200 – each month! Crazy! Our tenant is still continuing to pay on-time and we had zero maintenance issues this month! Best kind of rental to have. Another successful month for the history books. Dividend income saw a huge percentage increase this month which was a very welcome surprise. While the BEN special dividend really made the month a standout, I still had a mind-blowing increase of $459.55 over April 2017 even without the special dividend! This report really does exemplify the dividend investing strategy. Slow and steady wins the race. Exactly! The more cash I receive from dividend stocks, the more I kick myself for not starting earlier. So awesome, that loan pay down has to always look nice! Also, the dividend income vs. last year’s is unbelievable, even when excluding BEN’s special divvy. Nice job! Thanks Lanny! 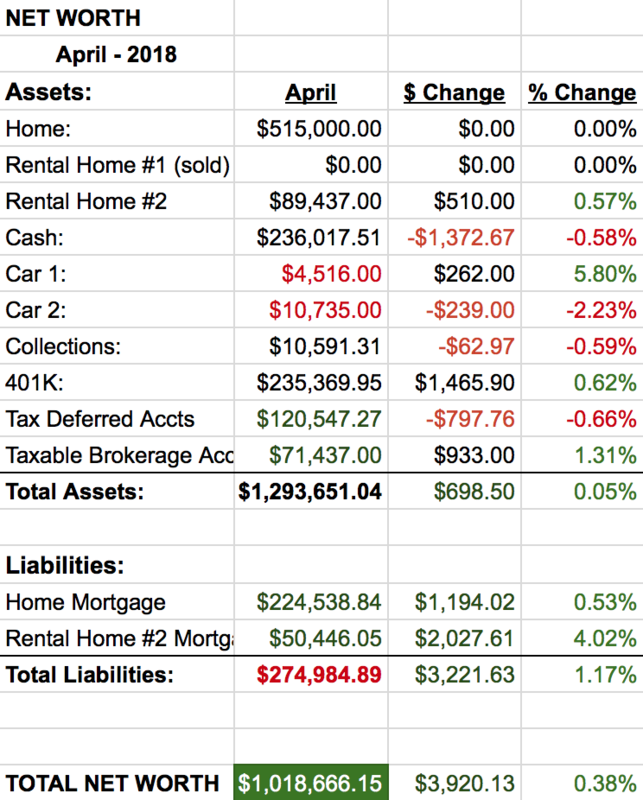 Paying down those mortgages feels great… the dividend income isn’t so bad either. While I was ecstatic to receive the special dividend, I’ll admit, my second thought was – dang, this is going to mess up my dividend income chart for next April 😉 Good problem to have! Excellent results, DP! I agree that your dividend total is impressive, even without BEN’s contribution. Lots of REITs helping the cause, but some other sectors sending dividends your way, too. Always good to see the net worth creeping upwards as well.